LONDON — Arsene Wenger praised Mesut Ozil’s "fight" as well as his skill as a "great football player" after the German’s impressive all-round display in a 5-0 thrashing of Premier League new boys Huddersfield Town. 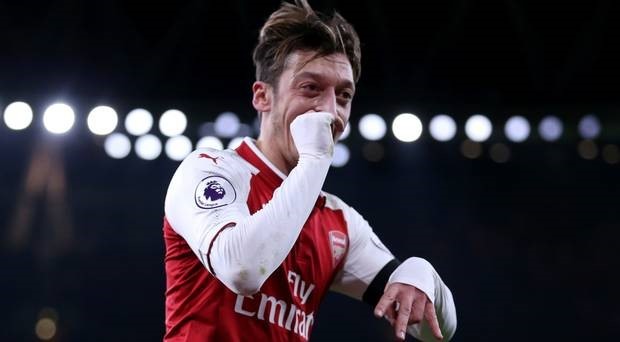 The Gunners’ seventh win out of seven at home in the league this season was confirmed thanks to an excellent second-half display from Ozil who contributed two assists and a goal in the space of four minutes at the Emirates Stadium on Wednesday. Ozil, told he will be staying with Arsenal come the January transfer window amid reports of interest from Barcelona, Chelsea and Manchester United for the playmaker who is out of contract at the end of the season, set up Olivier Giroud and Alexis Sanchez before scoring himself. Giroud also added a late fifth goal, his second. Veteran manager Wenger believes Ozil’s recent improvement has been down to the 29-year-old’s willingness to give his all, as he proved in a 2-0 north London derby win over bitter rivals Tottenham Hotspur earlier this month. "Ozil is fit and has added something people wanted to see -- against Spurs and tonight that he can fight and win the ball back," said Wenger. "He knows he is a great football player and he shows he can fight. "Our job is to encourage people to fight," the Frenchman added. "He always covered the distances in games and is at an age where he is mature. "I don’t know if he takes it (criticism) personally. Everyone wants to be acknowledged and judgements are sometimes harsh. The majority of people here love him. "If you look at the percentage of possession he always wants the ball, he never hides and is always available." However, Wenger put Arsenal’s performance in context by saying: "I was not pleased with everything. We played with a bit of fear at 1-0 and did not play with the same freedom. We were a bit inhibited. "Maybe we benefited from the fact (Huddersfield) had to give a lot for 70 minutes and then collapsed." French striker Alexandre Lacazette, who opened the scoring in the third minute, went off at half-time with a groin injury that will rule him out of Saturday’s match against Manchester United at least. "Lacazette has a groin problem and he will be out for Saturday certainly. He might be out for a while," said Wenger after a win that left the Gunners fourth in the table, seven points behind second-placed United and 12 adrift of runaway leaders Manchester City. Huddersfield manager David Wagner, who made six changes to his starting XI, insisted his side had kept Ozil quiet for the majority of the match. And he was equally adamant that with the Yorkshire side still five points above the relegation zone, it would not be the result of matches against leading teams such as Arsenal that would determine whether Huddersfield stayed up. "We wanted to defend Ozil as a group and we did this for 70 minutes well," said Wagner. "Then he showed all his qualities and we gave him too much time on the ball. He was as quiet as you can keep him before. "If someone is surprised we lost against Arsenal away then the expectation is not right," the German added.